A Profile represents a collection of checking and/or fixup points for a PDF document and (optionally) the relevant problems. 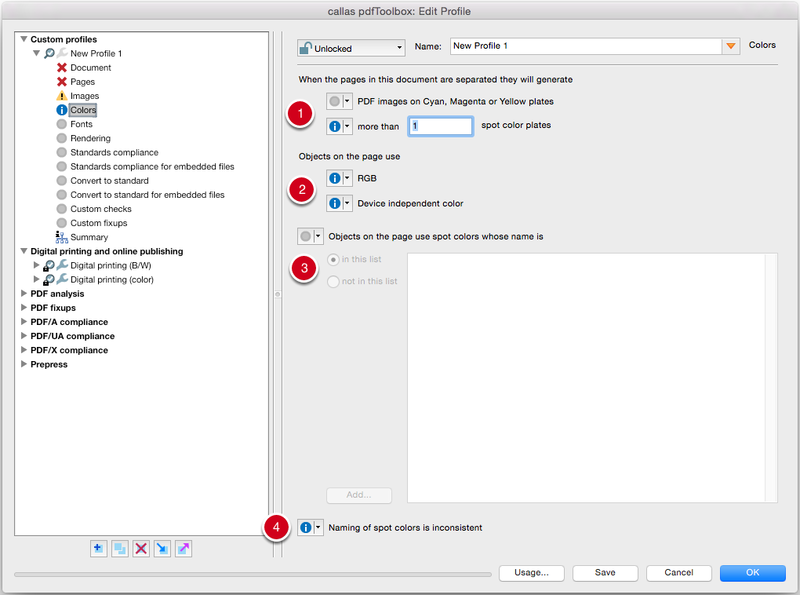 pdfaPilot provides a wide range of Profiles from a number of different categories, including digital printing, prepress, PDF analysis, PDF fixups and PDF standards. 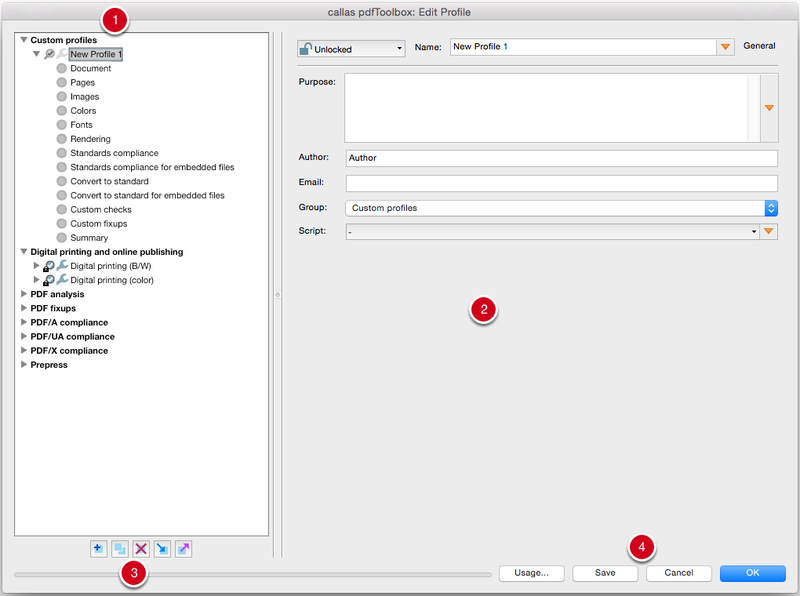 Users can also set up custom Profiles for use in their own workflows. We will now show you the options available in this context. A wide range of Profiles are available in the standard release. Custom Profiles can be set up in just a few steps. The button in the upper right of the Profiles window allows you to select from a number of options. The pull-down menu also includes the command “Create Profile...”. The right hand side of the window displays a number of settings depending on the selected category (2). 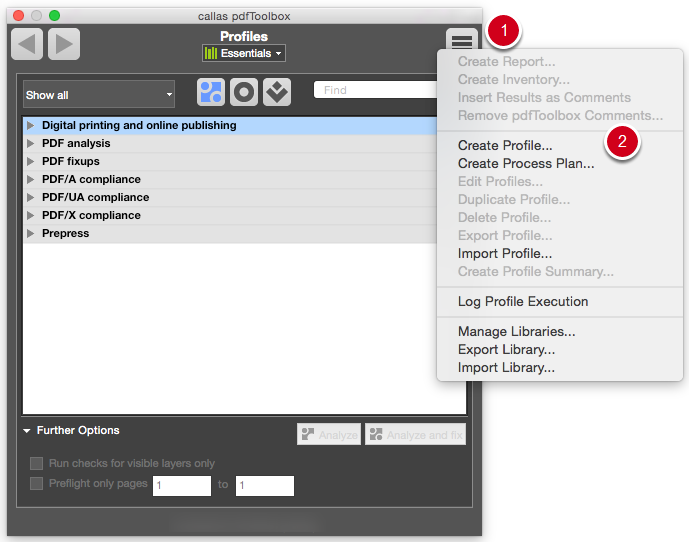 The buttons to the lower left allow you to add, duplicate, delete, import and export Profiles (3). At the lower right of the window, you will find the Usage... button (determining which Profiles use a selected criterion), as well as Save, Cancel and OK (4). The new profile will be stored in the “Custom Profiles” group. It will initially be given the name “New Profile 1”. A profile can be unlocked, locked or password-protected; the name should be specified to match the profile’s intended purpose. The orange triangle (here and elsewhere) allows you to to include variables and scripts. The Purpose field allows you to add explanatory text which will later be shown in the profile list when selecting a profile. Author and Email are intended to provide information about the author of the profile. Under Group, you can specify whether to store the profile under Custom Profiles or other groups. The profile can also be supplied with a script. 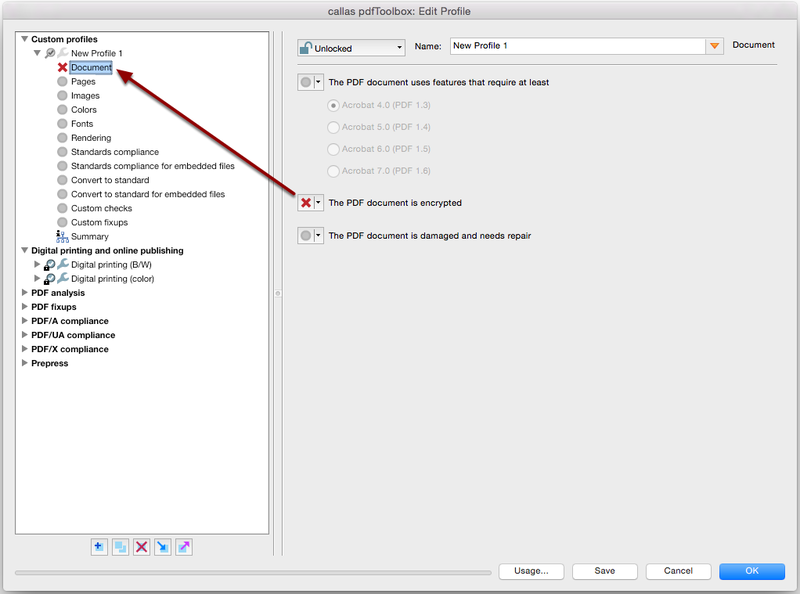 The first item affects PDF functions depending on the PDF version: “The PDF document uses features that require at least Acrobat 4.0 (PDF 1.3) and others.” Using the pull-down menu here (as with the other entries) you can specify how to report anomalies - as an error, as a warning, or as info. By default, this setting is inactive. “Document is encrypted” indicates any password protection applied. “Document is damaged and needs repair” tests whether the document is intact. Provided that the user has set the “Document is encrypted” test to be reported as an error, the error warning will also be visible in the profile overview to the left. Here, the highest tier applicable will be shown (Error before Warning, before Info, before Inactive). The Pages heading primarily allows you to set each individual parameter to one of the four settings Inactive, Info, Warning and Error. The page size can be tested precisely or within a tolerance range. When checking the number of pages, you can use the operators equal, not equal, greater than and less than. The Page size or page orientation is different from page to page option allows you to check whether page sizes within a document are standardized. 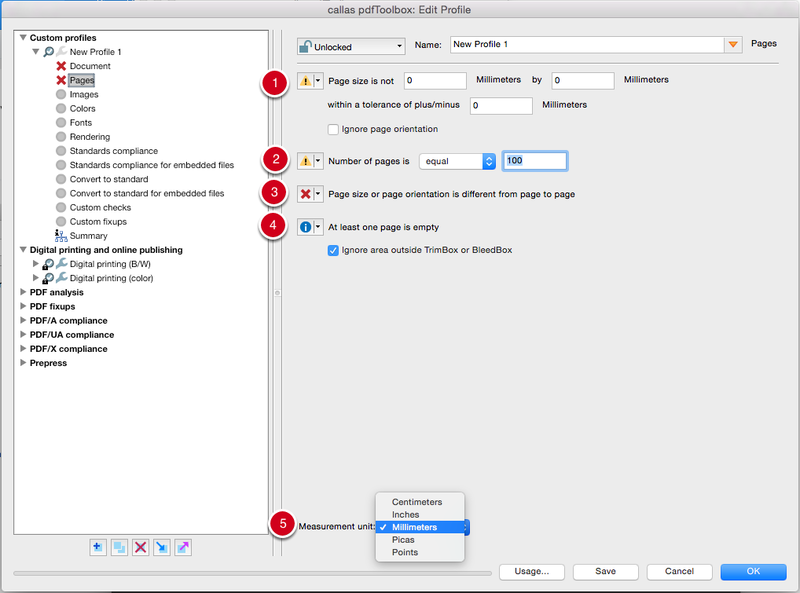 The At least one page is empty option allows you to identify blank pages. Finally, the user can also specify the measurement unit. The available options are millimeters, picas, points, centimeters and inches. Under Resolution of color and grayscale images is, you can specify minimum and maximum values for the resolution in pixels per inch. The Resolution of bitmap images can also be checked in terms of upper and lower tolerances in pixels per inch. Images are uncompressed detects images that are not compressed. Images use lossy compression allows you to identify images that use compression methods such as JPEG. ZIP, on the other hand, is an example of a lossless option for reducing image file sizes. Images use OPI relates to a currently rarely used process in which a file contains only low resolution placeholder images which are replaced with high resolution files on output. When the pages in this document are separated they will generate lets you determine whether Cyan, Magenta or Yellow plates will be produced (which may, for example, be undesirable for a document which needs to be output in black/white plus spot color). You can also specify an upper limit for the number of spot colors. The category Objects on the page use deals with color spaces. This allows you to query the following two items: RGB and Device independent color (ICC, Lab). Under Objects on the page use spot colors, you can make use of a custom spot color list. Messages can either be generated when the spot colors used agree with those on the list (the in this list option) or in case of a disagreement (when the not in this list option is selected). The Naming of spot colors is inconsistent option allows you to identify issues such as incorrect or duplicated spot color names. The Fonts section deals primarily with font embedding and the font type. The first category allows you to determine whether any fonts are not embedded. If fonts are embedded, you can test two conditions: as a subset or completely. The Font type is option differentiates between six possible types which can be tested separately. Finally, you can also use custom lists to check fonts, either to include or exclude them. Transparency used detects elements that use transparency. This includes shadowing. Custom halftone setting used finds unconventional halftone settings. Custom transfer curve used finds unconventional transfer curve settings. Under Line thickness is less than ... points, you can specify a threshold. Lines that are too thin can sometimes “break down” when printed. 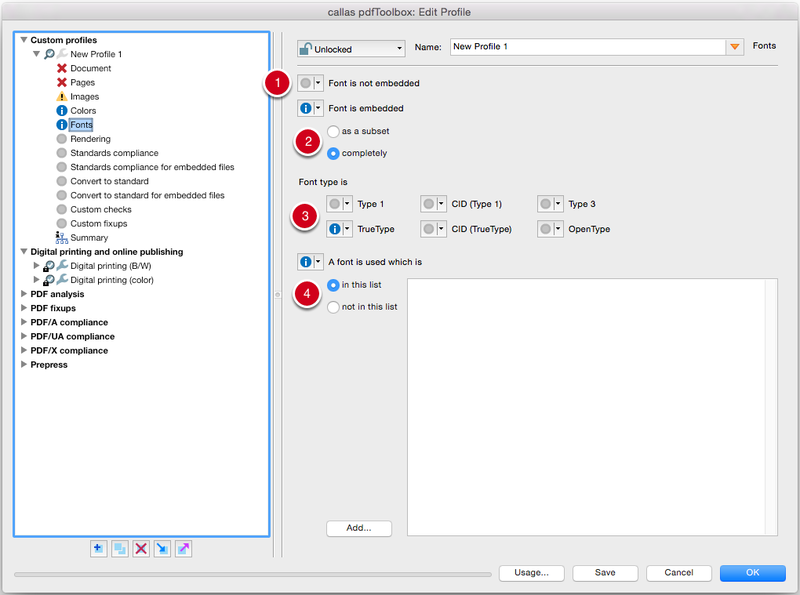 The Contains embedded PostScript code option can be used to avoid potential printing issues and other problems. The Standards compliance section relates to the various ISO standards available for the Portable Document Format. The category PDF is not compliant with any of allows you to integrate all currently available PDF standards into the query. 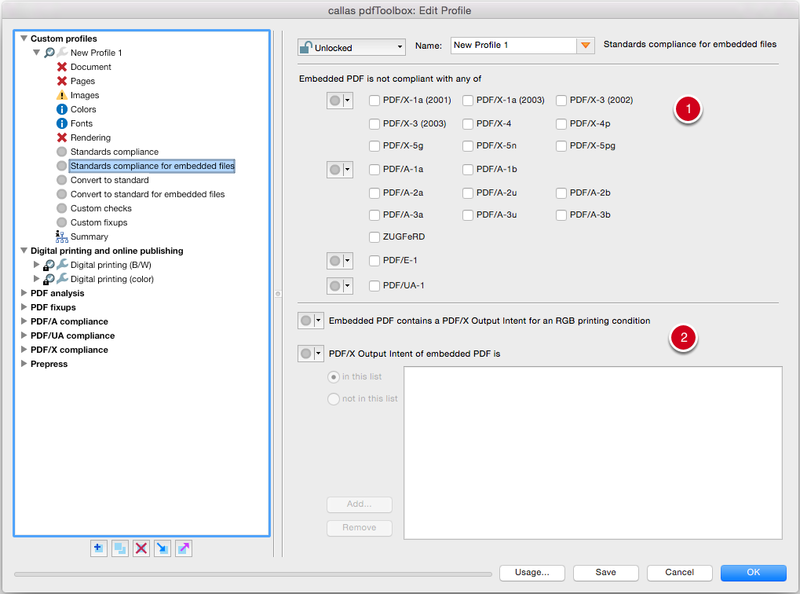 The second section is reserved for PDF/X, the PDF standard for prepress. 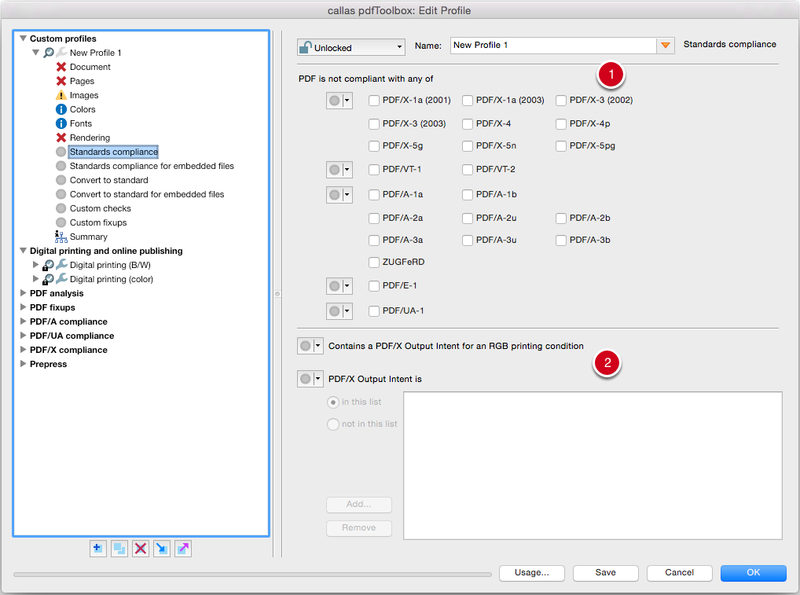 Here, you can determine whether a PDF contains a PDF/X Output Intent for an RGB printing condition. 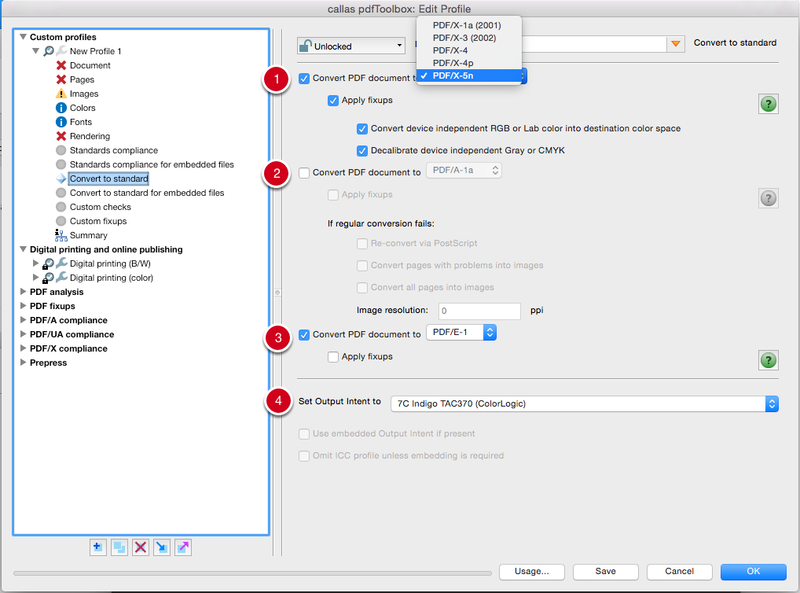 An embedded PDF/X Output Intent can also be compared against a custom list of Output Intents. 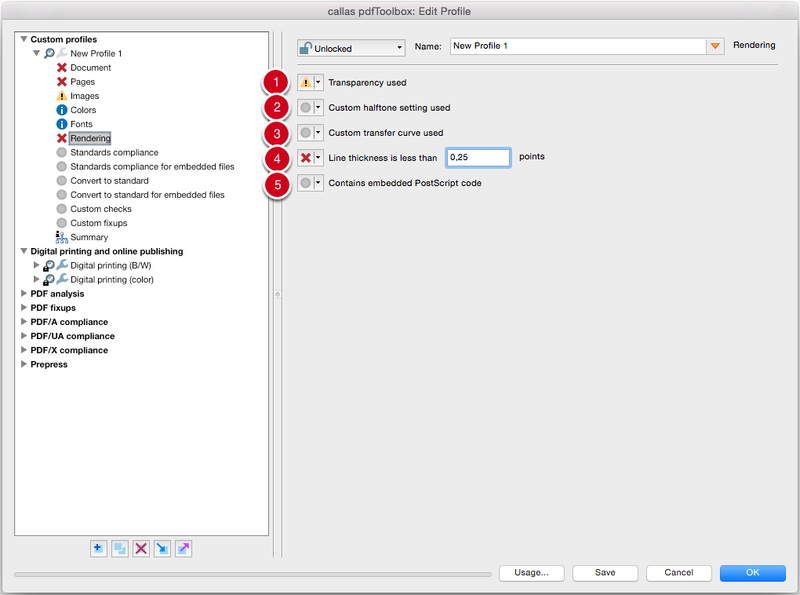 The PDF is not compliant with any of option again relates to all currently available PDF standards. 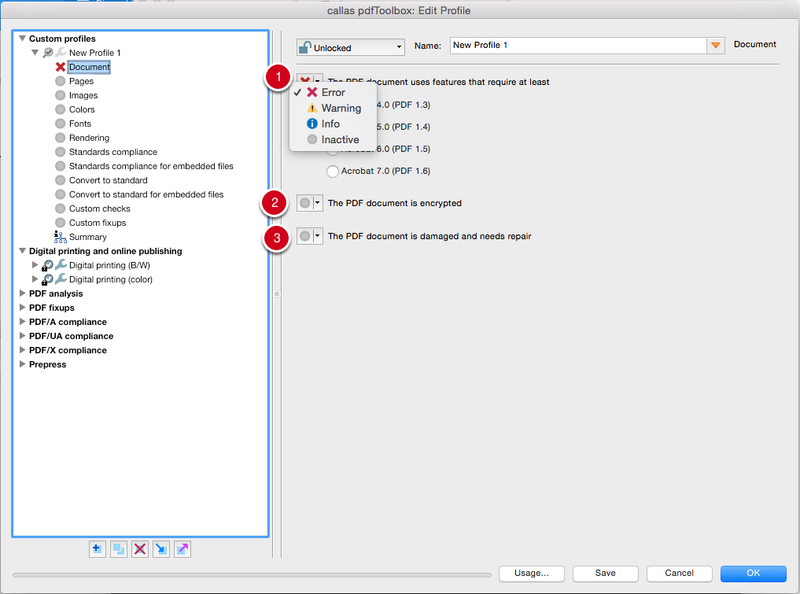 The second section again turns to the PDF/X standard for PDF printing. The Convert to standard section is particularly extensive. It is divided into conversion parameters for PDF/X (prepress), PDF/A (long-term archiving) and PDF/E (digital construction drawings). 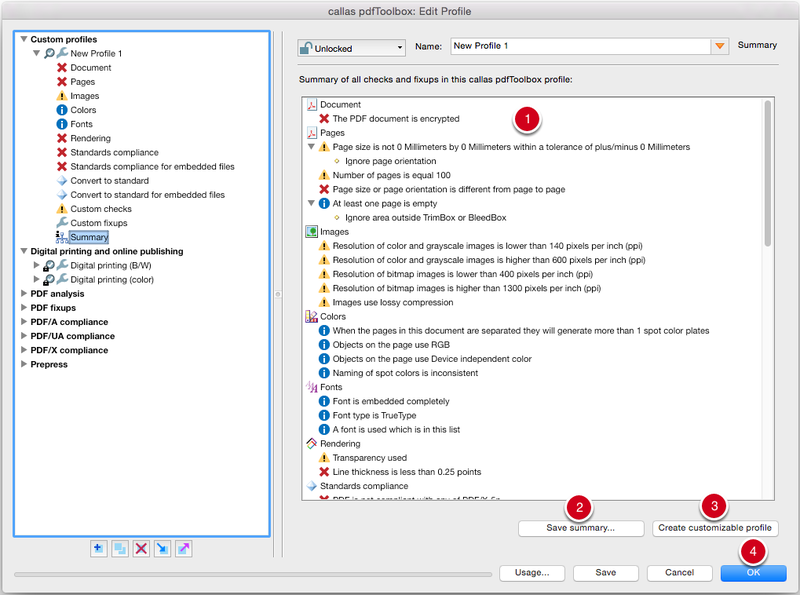 This section converts and fixes PDF files, rather than simply checking them. Under Convert PDF document to PDF/X, you can choose from a range of PDF/X versions from a pull-down menu. You can optionally Apply fixups by checking the box. Depending on the standard selected, two other options will be available: Convert device independent RGB or Lab color into destination color space and Decalibrate device independent Gray or CMYK. Under Convert PDF document to PDF/A, you can choose from a range of PDF/A versions from a pull-down menu. The Apply fixups box can be checked. If regular conversion fails, a number of additional options are available. 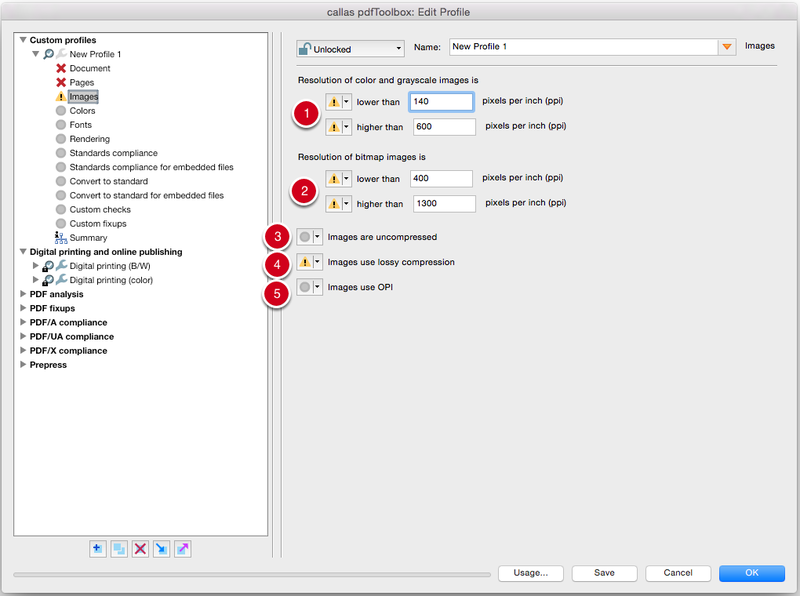 Re-convert via PostScript, Convert pages with problems into images, or Convert all pages into images. The last two of these options allow you to specify an Image resolution. The third standard is PDF/E. You can again Apply fixups here. Finally, you can also select the Output Intent from a pull-down menu. Two options are available here: Use embedded Output Intent if present and Omit ICC profile unless embedding is required (e.g. with modern Output Intents; this allows you to reduce the size of the resulting file to the size of the Output Intent). 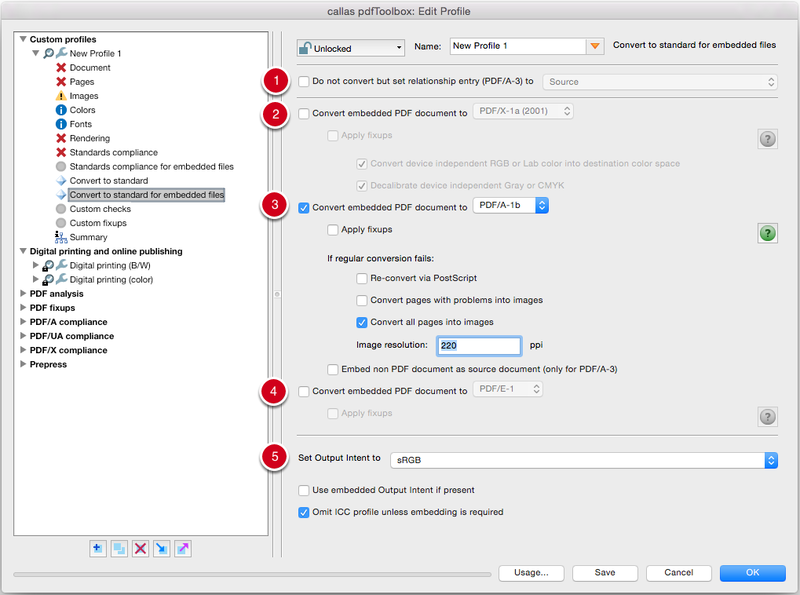 Convert to standard for embedded files offers very similar parameters to those shown in the previous step, but in this case they relate to embedded PDF files. The first section deals with the special case of PDF/A-3. This PDF standard also allows you to embed files left in their original state (not just PDF, but also other formats). Do not convert but set relationship entry (PDF/A-3) to ... allows you to define the relationship in one of a number of different ways, including Source, Data, Supplement and others. Convert embedded PDF document to PDF/X enables a number of different options as well as optional fixups. Convert embedded PDF document to PDF/A enables a number of different options as well as optional fixups. In addition, there are also the same backup options as before to determine how to proceed if regular conversion fails. 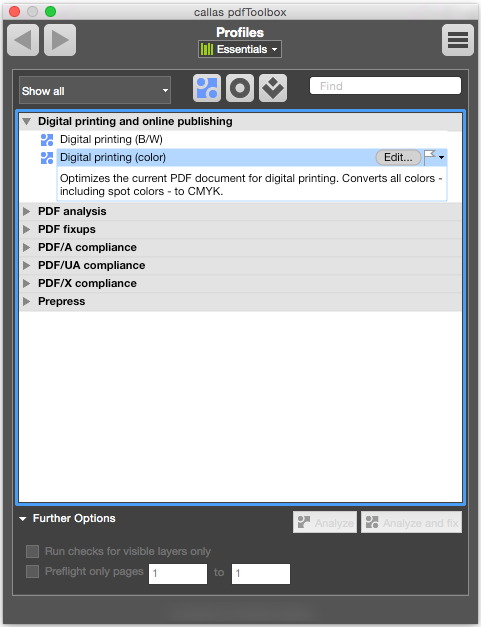 Convert embedded PDF document to PDF/E plus optional Fixups. 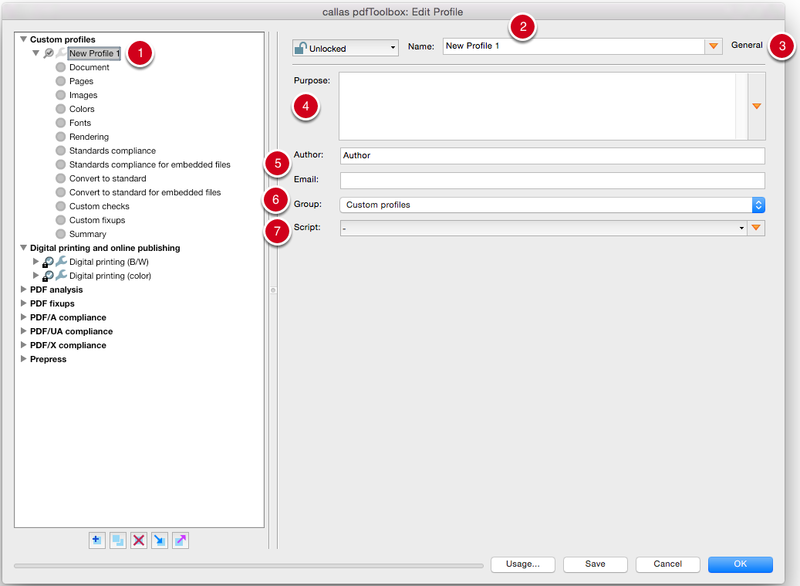 Under Custom checks, you can select entries from the list of all available pdfaPilot checks and integrate them into the new profile. The right hand side shows the list of Checks available in pdfaPilot. It can be considered the “inventory” available to you. The checks shown will be those available in the currently selected library (in this example, Essentials). If you know the name of a given function, you can use the Search tool to make it easier to find. Click on a check in the list to see more detailed information. Click on the blue arrow symbol to the left to move the selected check to the middle column. This will add it to the profile you are currently creating or editing. The middle column shows all Checks used in the current Profile. You can use the pull-down menu to specify whether the check should return an Error, a Warning or an Info message. You can also use the orange triangle to add and manage variables and scripts. The buttons allow you to add, duplicate, edit and delete checks. Under Custom fixups, you can select entries from the list of all available pdfaPilot fixups and integrate them into the new profile. 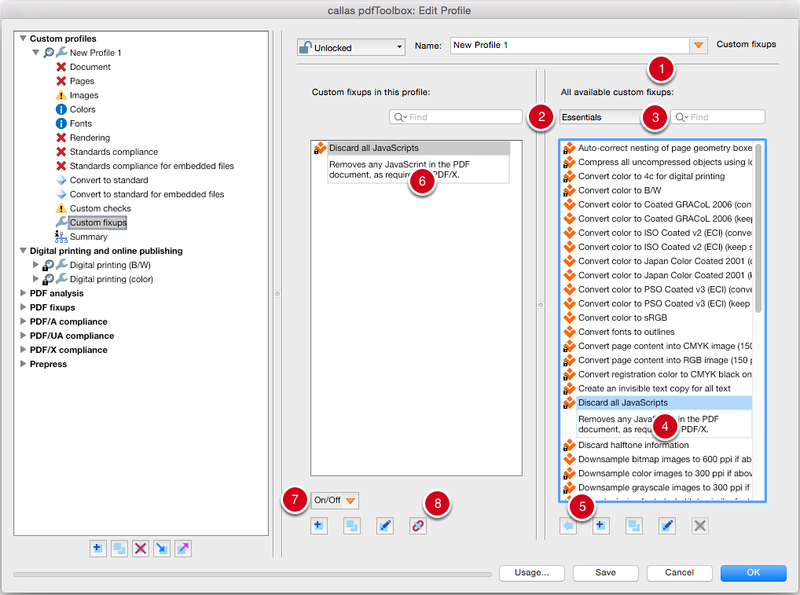 The right hand side shows the list of Fixups available in pdfaPilot. It can be considered the “inventory” available to you. The Fixups shown will be those available in the currently selected Library (in this example, Essentials). If you know the name of a given Fixup, you can use the Search tool to make it easier to find. Click on a Fixup in the list to see more detailed information. Click on the blue arrow symbol to the left to move the selected Fixup to the middle column. This will add it to the Profile you are currently creating or editing. The middle column shows all Fixups used in the current Profile. 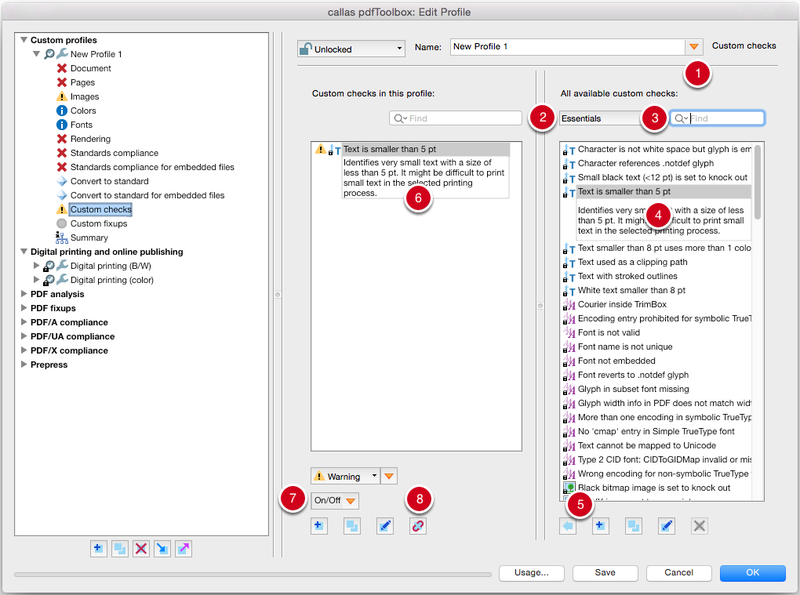 The buttons allow you to add, duplicate, edit and delete Fixups. In the Summary, you can see a detailed overview of all Checks and Fixups included in the newly created (or edited) Profile. The entries are grouped by section, i.e. Document, Pages, Images, Colors, Fonts and so on. Optional: You can Save the profile overview. Click on the corresponding button to have the program save a comprehensive report in PDF format. Optional: You can also generate a customizable profile based on the current Profile - a duplicate, in other words - which you can configure further. Click on the OK button to finish setting up the Profile.